Dedicated to the Fatherhood of God and the Brotherhood of Man. 1/1, September 1907. $1.50 a year. After several issues and an eight-year hiatus, the journal was begun again in June 1915, with the numbering restarted at 1/1, and with the issue of September 1915 (possibly the last) it became The Messenger. 100 pp., $1.50/year. Helen ("Nellie") Craib Beighle (1853-1916) was a medium and an electric physician. She wrote a book of Psychic Poems (1907) and The Book of Knowledge: Psychic Facts (1903), and was honored with a glowing tribute by J.J. Owen: "Our Little Doctor" Helen Craib-Beighle and the Magic Power of Her Hands (1893). See also J.M. 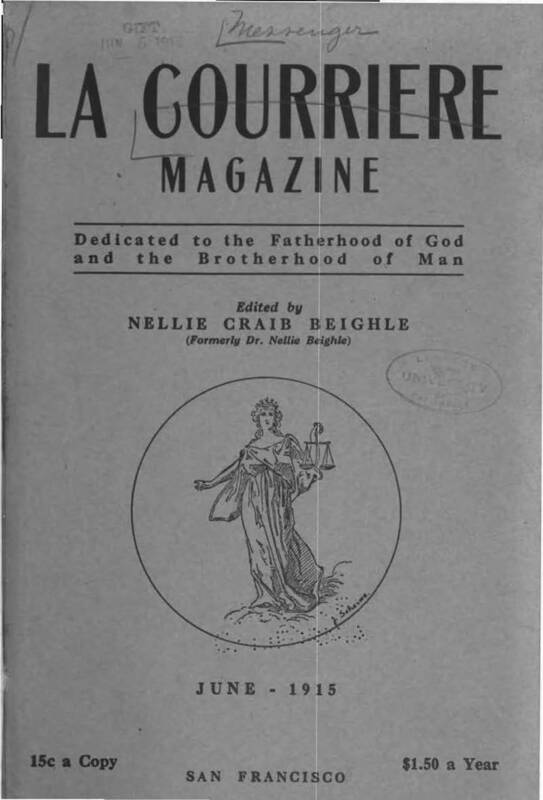 Peebles, "The Bodily Departure and Spiritual Ascent of Dr. Nellie Beighle," Spiritual Alliance Weekly (March 25, 1916), who testified "as a regular physician and officially registered in Los Angeles" that Beighle's cures and diagnoses were miraculous. Like many other mediums of the time, Beighle easily made the transition to New Thought and ran a School for Enlightenment in San Francisco. University of California, Berkeley; California State Library; California Historical Society. San Francisco, CA. Editor: Dr. Nellie Craib Beighle. September 1915. Succeeded La Courriere and its continuation La Courriere Magazine. University of California; NSAC, Lily Dale.